When a young girl named Kikko realizes her father has forgotten the pie he was supposed to bring to Grandma's house, she offers to try and catch him as he makes his way through the woods. She hurriedly follows her father's footprints in the snow and happens upon a large house she has never seen before. Curious, Kikko peers through the window, when she is startled by a small lamb wearing a coat and carrying a purse. Even more surprising, the lamb speaks, asking her in a kind voice, ?Are you here for the tea party?? Suddenly, Kikko realizes her trip through the woods has turned into something magical. Award-winning author and illustrator Akiko Miyakoshi has beautifully crafted an original fairy tale picture book that will delight and enchant. The unique visual presentation features mostly black-and-white art with the occasional use of red or yellow to help guide readers through the pages. Kikko's blend of courage and reticence along with her inquisitive nature makes her a character children will relate to, and the many unexpected twists and turns of her adventure keep the intrigue growing. 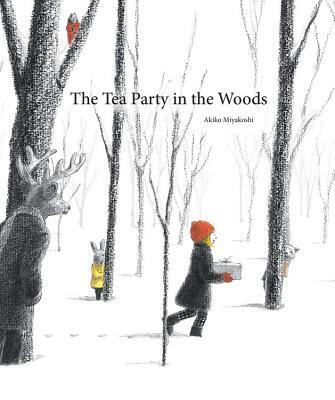 The ambiguous ending --- in which it is not clear whether Kikko imagined the tea party or if the animals simply disappeared back into the woods --- provides a terrific opportunity for children to weigh in on what they think happened. This book also could launch classroom conversations about children's own experiences of being trusted with big responsibilities. Akiko Miyakoshi was born in Saitama, on the island of Honshu in Japan. She began creating picture books while studying visual communication design at Musashino Art University. Her first picture book, The Storm, won the Nissan Children's Storybook and Picture Book Grand Prix.